Quovo is a fast-growing startup that enables fintech companies and enterprise-level financial services providers to connect to consumer financial accounts. The company is based right in the heart of Manhattan and has an open-space office where everyone is within arm’s reach of each other. I was happy to get the chance to talk to Lowell Putnam about Quovo and its offerings. Lowell came to wealth management from the investment banking space. He worked at Lehman Brothers and Barclays Capital, where he worked in the Financial Institutions Group with a specialization on consumer lending. In 2008, Lowell started trading stocks and became an active personal investor. This is when he faced problems tracking his own investments over time. Then, Michael Del Monte, who is CTO at Quovo today, began working on pulling data from websites or APIs where people had retail brokerage accounts, and then doing performance reporting for those working in the retail sector. This data-pulling, which started as a hobby, coincided with the start of the robo-advisor trend and the explosion of innovation in the wealth space. Once Lowell and Michael realized that they had built an interesting new platform for pulling outside account data into other platforms, which they anticipated would become a much bigger trend, they decided to join forces with Niko Karvounis, CPO of Quovo, and make a business out of it. Quovo has raised more than $20M in total funding over four rounds. In 2013, the startup raised $1.4M in Series A funding for investment analytics; the investment drive was led by Long Light Capital. At that time, Quovo had the platform in beta with users ranging from sophisticated hedge funds down to retail investors with an E*Trade account. In 2015, Quovo closed a $4.75M funding round led by Fintech Collective. Long Light Capital participated again. Quovo offered a full-stack platform that provided aggregation and business intelligence analytics; its dashboard tools made complex data insights intuitive. Two years later, in 2017, Quovo raised $10M in Series B funding. F-Prime Capital and Napier Park Financial Partners co-led the round. 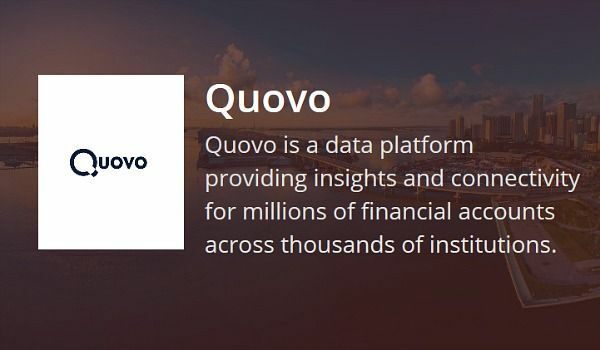 Quovo used the funds to accelerate the growth of its suite of data analytics offerings, including the bank authentication API and Quovo Connect module. Finicity, which has developed more than 16,000 bank integrations and provides a suite of APIs for financial management, payments, and credit decision making. Yodlee, which offers financial applications and personal financial account information for banks, entrepreneurs, and individuals. In 2015, Yodlee was purchased by Envestnet and is focused on investment data. Plaid, which aggregates bank transactions and provides APIs to help financial applications connect with user bank accounts. Morningstar’s ByAllAccounts, which provides a data-aggregation system that gathers, transforms, and delivers financial account data. However, Lowell thinks that Quovo has a slightly different focus than the competition. Lowell sees his company to have the advantage of being much younger, using other technologies, and having different cost structures. On their site, Quovo highlights three different industry verticals the company works in: wealth, lending, and payments, as opposed to targeting specific categories. According to Lowell, borders between startups and large institutions are increasingly blurring. At the same time, Lowell mentions big insurance companies that have their FinTech squads and teams building financial tools. Quovo’s offering has become part of these tools. Thus, Lowell considers these enterprises as akin to FinTech startups. Quovo aggregates data about bank accounts, investments, credit cards, insurance, student loans, etc. Unlike most startups, which think mostly about new features, Quovo expends a great deal of effort on maintaining the built infrastructure and technology. Lowell states that connections must be fixed quickly to ensure that their clients don’t face service disruptions on their own platforms. According to Lowell, Quovo runs outlier reports on millions of accounts every night to identify inaccuracies, delays, and other issues. The best QAs are the clients: once a client finds a problem and informs Quovo about it, Quovo’s team solves it quickly and notifies both those who have discovered the issue and everyone else who has yet to do so. Being in the middle, Quovo has the ability to ask institutions to correct their data, but they also build their own processes to deal with broken data and correct it if possible. Otherwise, the system stops sending data to Quovo’s customers until the institution in question corrects its own problems. He describes instant account verification as “the happy path.” In this case, the user authenticates at an institution with his/her credentials and Quovo is then able to retrieve the information needed to initiate an ACH process. Since some institutions don’t make full instant authentication information available, users may need to validate an account. In this case, Quovo offers “the less happy path”—it initiates and automatically verifies microdeposits using its aggregation technology to parse an account’s transaction history for the receipt of the test deposits. “The unhappy path” is required when an account is not connected to Quovo (e.g., Quovo doesn’t cover an institution). In this case, the system initiates a traditional microdeposit but cannot verify it; the customer needs to check it two days later and verify the account. Talking about the company’s upcoming plans, Lowell mentions their Cue product. The company aim to create a simple query-based Boolean system that checks certain parameters within an account and alerts advisors if they correspond to specific conditions. Quovo is also working on predictive cues that look for life events that can be determined from significant changes in spending or in the client’s cash flow. For this purpose, the system analyzes spending transactions and uses machine learning and AI in its algorithms. 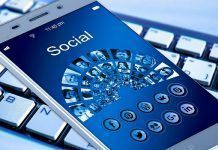 Lowell believes that the most complicated machine learning is used for the least interesting data points, such as identifying whether the account is taxable. Unlike many other companies, Quovo prefers to not customize their product to their customers. Instead, Lowell says that prefer to make their features configurable. The Dev-Ops team is separate from each of the other teams, but services all of them together. According to Lowell, the company includes more than 70 people, about 30 of whom are technical software engineers. The platform is based in AWS and has multiple availability zones. The entire architecture is cloned to Canada, and Ireland. The company builds a continuous integration and continuous delivery (CI/CD) process that allows it to deploy across jurisdictions. The deployment layer is separate from other layers; it includes API servers that are independently load balanced. At Quovo, Datadog is used to monitor all processes. Since the company can’t send any data from their database outside, the team had to develop their own internal administrative tools. For the CA process, they have benchmarks and tests that cover all code. To enable their clients test changes before they are pushed into production, Quovo has a number of stage environments that are independently maintained for clients. Quovo already has a number of small and medium-sized FinTech companies and larger institutions as customers and data sources, and is now ready to win larger customers. The company has proved their ability to efficiently process manifold data, protect end users and be a valid contender for large deals. 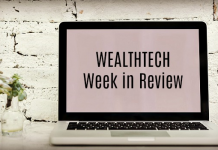 We may expect to see Quovo finding new lines of business within wealth management and expanding their strategy into other FinTech areas, such as insurance, lending, mortgage, etc. It looks like the company’s vigorous team will be able to offer data services based on any retrieved financial data.